Ginseng, Siberian, Eleutherococcus senticosus syn: Acanthopanax senticosus, is also known as Eleuthero and Ci-wu-jia. 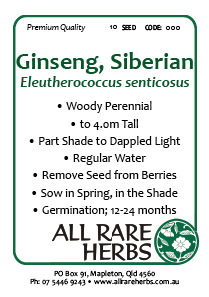 Siberian Ginseng is a classic tonic herb. Approved by German Commission E as a remedy for fatigue and immune system support. Utlised by the traditional medicine systems of China, Japan and the modern European and American folk medicine for a broad range of uses. The root assists in adapting to stress, regardless of the source of the stress ie. emotional, physical or environmental. Siberian Ginseng is native to Siberia, North China and North Korea. A woodland plant, it prefers well-composted, deep, free draining soils in a protected position with filtered light. Frost resistant but drought tender. A woody perennial to 6m. Be the first to review “Ginseng, Siberian, seed” Click here to cancel reply.